It seems like every day we keep stumbling upon some “licks”. Those things are all over the internet being at our disposal. But what are they really? What is a “lick”? Fortunately it’s not that difficult to explain this whole thing. In popular music genres such as rock music, a lick is “a stock pattern or phrase” consisting of a short series of notes that is used in solos and melodic lines. The term is most often used by rock and blues musicians who play the guitar. 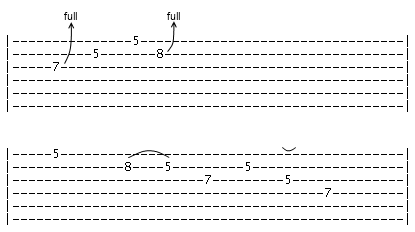 Licks in rock and roll are often used through a formula, and variations technique in which variants of simple, stock ideas are blended and developed during the solo. In heavy metal, the term “hot lick” is often used. In a jazz band, a lick may be performed during an improvised solo, either during an accompanied solo chorus or during an unaccompanied solo break. Jazz licks are usually original short phrases which can be altered so that they can be used over a song’s changing harmonic progressions. A lick is different from the related concept of a riff in that riffs can also include repeated chord progressions. Licks are usually associated with single-note melodic lines rather than chord progressions. However, like riffs, licks can be used as the basis of an entire song. Single-line riffs or licks used as the basis of Western classical music pieces are called ostinatos. Contemporary jazz writers also use riff- or lick-like ostinatos in modal music and Latin jazz. A lick can be a hook, if the lick meets the definition of a hook: “a musical idea, a passage or phrase, that is believed to be appealing and make the song stand out”, and “catch the ear of the listener”. A lick may be incorporated into a fill, which is a short passage played in the pause between phrases of a melody. To give you an even better image on what a lick is let’s take a look at couple of examples of cool blues licks. I hope it was helpful, use the comments section to tell me what you think, and see you next time.